How am I contributing to Love? I took that last question with me as I entered the journey within. 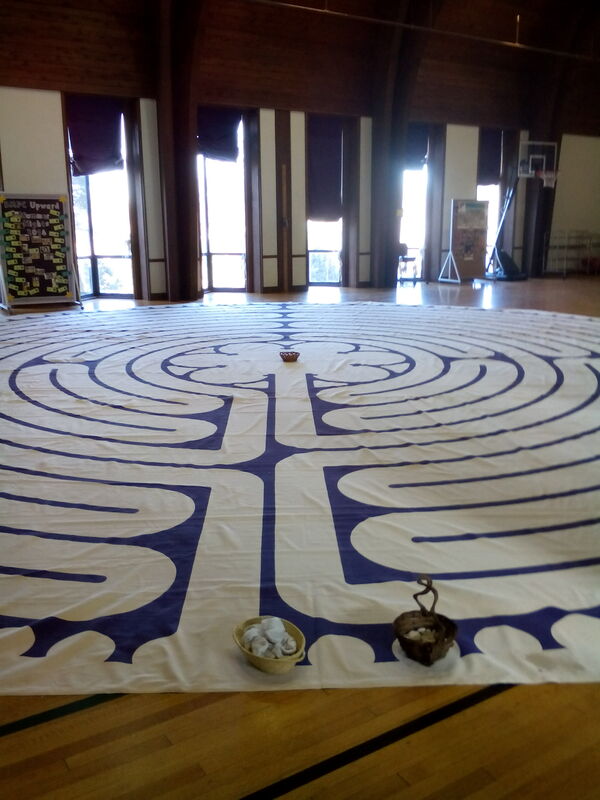 The first phase of the labyrinth walk is about “letting go.” I asked myself what is it that I needed to let go in order to approach or possibly comprehend Love. Things such as inner barriers and judgment came rapidly to mind. There were part of my conscious awareness, and they have been on my radar for a while. No surprise here. What came from within later on between loops is Prejudice—no less than that. Am I prejudiced? Certainly, and the slap in my ‘spiritual face’ last Tuesday was a good reminder that I do not uphold and honor a person’s True Nature in every individual that I come into contact. A neighbor of ours, who doesn’t look very sociable and engaging, came to clear our driveway with his snow blower; it was an ‘out of the blue’ occurrence that forced me to reconsider my opinion of him. What is it that I’m going to do with my judgment of him now? What purpose does it serve, if any? The other insight that popped up is the need to value and honor differences—differences of any kind; as if twenty years of working in the field of cross-cultural relations didn’t teach me to walk my talk and straighten my thoughts. Obviously, there is always a way to do better and kinder. Arriving in the center of the labyrinth, I noticed the rays of sun illuminating the path. By then, my accompanying question had morphed into, “How am I contributing to Love?” The sun made me think of fire, and the image of a bonfire came to mind; I could see everyone contributing something to it, be it a twig, a branch or a log—it didn’t matter. What mattered is that together we could make the flames of the fire reach higher, and brighter. I pondered the question for myself—how can I contribute to this fire of Love? Part of the answer came through my walk as I met a person whose last name was ‘Healy.’ Healing—my own healing, and what I purged in the process—is certainly something I can contribute; it was an inner darkness that vanished into smoke and disappeared in order to no longer burden humanity’s shoulders. Another element that came into my awareness while in the center is Freedom. I then recalled the words of Krishnamurti that I quoted in the second episode of my radio show. The childhood baggage that I burned along the way of my healing process has indeed given way to deeper awareness, and hopefully deeper wisdom. This is also something I can contribute to the fire of Love. 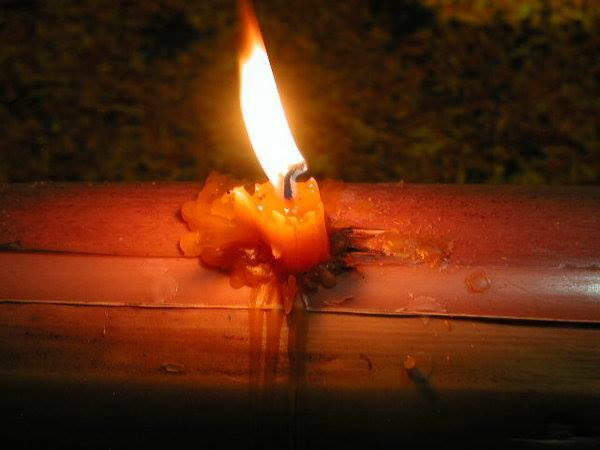 This element of freedom made me think about the image that I used for next week’ show, a candle burning in the middle of a long piece of wood. Love and a fire burning are indeed of the same vein, and Pierre Teilhard de Chardin’s words started to make sense. humanity will have discovered Fire. The return phase of the labyrinth is called Union; it is a phase when we bring back to the world the thoughts and ideas we harnessed in the center. I can’t seem to remember anything specific, as I was playing with the idea of Union with the Divine, the Divine that lay in the center of who we are, deep down, and whose desire is to find a way out. How can we possibly express that ‘Divine in us,’ if not through Love—Love and Appreciation for oneself and for anyone and anything else around us? This entry was posted in My Personal Path, Quotes on consciousness and tagged fire, Freedom, labyrinth, Pierre Teilhard de Chardin, walk. Bookmark the permalink. 5 Responses to How am I contributing to Love? Merci, Gilles pour cette magnifique contribution à la Lumière et à l’Amour. J’adore ce labyrinthe, il ressemble à celui de la cathédrale de Chartres et je fais souvent le parcours, sur une feuille de papier où il est reproduit. Merci de ta visite, chere Elisabeth. Ca me fait toujours plaisir de te voir. Ce labyrinthe etait en effet du type “Chartres;” fort grand ma foi, et le parcourir, de facon generale, procure encore et toujours cette sensation de descente interieure, avec des “bulles de conscience” qui remontent a la surface de temps a autre. Je te souhaite de beaux parcours, papier a la main, et te souhaite une tres belle semaine. Il ne devrait pas faire si froid que cela demain. Ce labyrinthe est une merveille du cheminement intérieur, et je rêve de le parcourir en vrai. Contente qu’il fasse moins froid parce que j’étais inquiète, avec ces tempêtes de neige. As-tu un labyrinthe en vue pour cette aventure spirituelle? Il y en a beaucoup ici, notamment dans les eglises. Tu peux certainement aller a Chartres, mais consulte leur calendrier car le labyrinthe n’est pas disponible tres frequemment. Il est recouvert de chaises la plupart du temps! Belle semaine a toi aussi!